4th Minati Hazarika lecture went well today in Jorhat in association with Vivekananda Kendra Kanyakumari Branch Jorhat. lege delivered the memorial lecture on Ballad Songs of Asom. Prof Saikia explained the origin, background, classification of ballads singing the songs in Harmonium. How the ballads give us an idea of the social scenario and culture of a particular time was very clearly depicted in the lecture. Welcome address was delivered by Sri Saumitra Puzari, Saha Prant Pramukh, Assam Prant. The introduction of Vivekananda Kendra with special reference to VKIC was conducted by Sri Dipankar Mohanta, EC member, VKIC. Kathakali Bhattacharjee offered the vote of thanks. The comparing part was conducted by Sri Swarup Sharma, Vibhag Pramukh, Jorhat-Sivasagar Vibhag. Man. 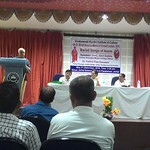 Pravinji, Smt Sova Rani Sarma, Prant Pramukh, Assam Prant, Kum Raboti baidau were present in the lecture. A follow up planning meeting from VKIC perspective was also there with organising team in presence of Man Pravinji after the program. We have planned Quest subscription, Quest article contribution, regular focused sitting with focussed group in Jorhat are finalised. Vivekananda Kendra Kanyakumari, Br.-Chinchwad had organized a 10 day long open shibir for students of 10th and 12 standard "Pariksha de hanste hanste" from 06/05/2016 to 16/05/2016. 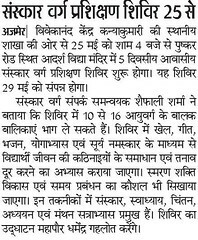 20 students had participated in that shibir. Shri Vishwasji inaugurated the shibir and gave valuable guidance to the student's on the opening day on 06/05/2016. The students were taught about simple techniques of studying, concentration, mind games, games on the ground and how to take notes, memory retention meditation etc. On the last day of the shibir Dr. Nilima Sardeshpande spoke about the Diet and daily routine. She interacted with the students and their parents to help them clear their doubts and misconceptions. Our karyakrta's Mugdhatai, Sushritatai, Tejashri tai, Paradkar Kaka, Kulkarni kaka, Jagajeet, Rohit and Mandar put in lot of efforts for this shibir. We are thankful for the valuable guidance of Shri Vishwasji, Mrs. Sandhyatai, Mrs. Arunatai, Smt Tarode tai and Dr. Sardeshpande. We sincerely hope that this shibir helps the student not only with their exams but also further ahead in their life and future always to create a better and sincere citizen. Vivekananda Kendra Arun Jyoti, Tezu branch conducted Karyakarta Prasikshan Shibir at VKV Tafrogam, Tezu. The shibir started at 5.00 pm on 24 March 2016 and concluded at 09.00 am on 29 March 2016. A total of 78 karyakartas had participated out of which 29 were brothers and 30 were sisters. The organizing team consisted of 19 karyakartas brothers 10 and 09 sisters. Shri Kruleso Ngadong, Nagar Pramukh VK Tezu, inaugurated the program by lighting the lamp. 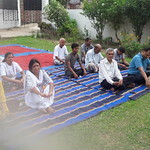 The participants were grouped into 6 namely Amik Matai, Ringya Jwomalo, Bhagawan Buddha, Tangchow, Klumiya and Nani Intaya. Bhajan was conducted. After that the participants sat with their respective group members and introduced themselves. Various games were conducted and Shibir Geet was Rashtra ke liye Jiye. The main aim of the camp was to create more karyakartas to inculcate leadership qualities and to train them for handling Sanskar Varga and Kendra Varga. The sessions on various topics including “Personality Development”, “Disciplinal”, “Swami Vivekananda as Nation Builder”, “Our Culture Our Pride Our Life”, “Vivekananda Kendra in Arunachal Pradesh”, “Patriotism in Action”, “Motivate for Sanskar Varga and Kendra Varga” and “Ahuti Satra”. by Chow Chantkong Namchoom (Vivekananda Kendra Ignited Youth Forum Coordinator), Smt. K.K. Reena (Principal VKV Tafrogam ), Smt. Sailu Billai (Principal VKV Tezu), Shri Ambralum Gamre (IFCSAP Secretary Lohit Unit), Smt. 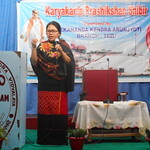 Mantilu Tawsik (VK Tezu Sah Nagar Pramukh), Smt. Hage Bibijan (Viyvastha Pramukh VK Tezu), Ashok Atale (Nagar Sangthak Tezu) and Shri Rupesh Mathur (Prant Sangthak Arunachal Pradesh) respectively, improved the intellectual growth of karyakartas. In Various Activity of shibir Tejas, Shram Parihar, Manthan, Krida Yoga, Geet Abhiyas, Nipunya, Bhajan Sandhya, Prerana Se Punaruthan to improve Karyakartas. CONCLUDING SESSION: The concluding session started at 9.00 pm with prayer followed by introduction of Dr. Tashi Talo Principal Indira Gandhi Govt. College Tezu. Yoga Class held in Vivekananda Kendra Arun Jyoti, Roing from 4th may to 14th May 2016 on from 5.30am to 7.00am at Roing Town. 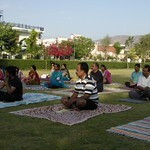 Total 32 participants had attended the yoga class in age group from 18 to 50 years. In the Valedictory Function on 14th May started from 6.30am. The program was graced by Shri Ravi Dhawan (IAS) Deputy Commissioner Roing, Lower Dibang Valley District as the chief Guest at the presence of Shri Jatan Pulu, VKV Arunachal Pradesh Trust, Trusty Member and Shri Bishen Mepo Member VKAJ Roing. The chief guest lauded the Nobel works of Vivekananda Kendra arun Jyoti in organizing such Events, also expressed the benefits of yoga in the improvement in the quality of life. The welcome address given by miss Sumila Linggi, Nagar Pramukh VKAJ, Roing and report on Ten days yoga class given by Shri Yashik Pertin, Nagar Sanchalak VKAJ Roing and introduction on Vivekananda Kendra Services in Arunachal Pradesh given by Miss Bulia Pulu, Samprak Pramukh, VKAJ Roing. One of the Participant Dr. Nangkong Yirang shared his personal experience and benefits in attending the yoga class, the entire yoga class instructed by Shri Ashok Atale, Nagar Sangthak, VKAJ Tezu. The ten days Yoga Class had Breathing and Loosening Exercises, Suryanamaskar, Aasan, Kriyas, Pranyam, Participants and discussion on ashthang Yoga like - yam, niyam, aasan, pranyam. the Yoga demonstration by Chow Ashoka Singkai, Chow Meokhun Mungyak Karyakartas of Vivekananda Kendra Arun Jyoti, Namsai. The programe concluded with the vote of thinks by miss Kago Yaji, Sah Samprak Pramukh VKAJ Roing. 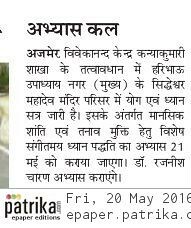 Vivekananda Kendra Arun Jyoti organized some Free Medical Camps in Namsai district of Arunachal Pradesh from 10th May to 14th May 2016. Three camps were organized at Mahadevpur IV, Dharampur and Dirak Miri villages of Lekang circle and two camps were organized at Monhofai and Joona kachari villages of Namsai circle. 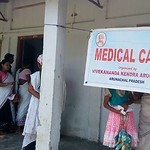 A total 860 patients were treated in these camps by the Mobile Medical Team of Vivekananda Kendra and free medicines were distributed. It is to be mentioned that all the three villages under Lekang circle were flood affected and the recent flood created havoc in these areas. So, the medical camps bought relief to the ailing patients, most of them were elderly and children. Volunteers of Vivekananda Kendra, Namsai Nagar and Mahadevpur area, All Lekang Youth and Student Union (ALYSU), Adi Students Union of Lekang block joined hands with our medical team for the camps. The villagers appreciated the service provided at their doorsteps. In this month’s newsletter, ever clever Tenali Raman is explaining the Ruler the holistic approach to Health. In our happenings section, we have our usual training programmes on ‘Sustainable Agriculture’, workshop on Varma practices and Mason training at a far-off Dist of Perumbalore of Tamilnadu. Please download and read our newsletter here. The Nagpur branch of Vivekananda Kendra Kanyakumari had organized a residential Personality Development Camp from 24th to 27th April, 2016 at Ravindra Nagar Sabhagruha. 81 children from the age group of 10 years to 16 years participated in the camp. The theme of the camp was “Atulya Bharat” – Incredible India. The inaugural session started at 10.30 am on 24th April with prayer. Shri Vaibhav Joshi , Shibir Pramukh, in his inaugural speech motivated the children and congratulated them for choosing to attend the camp. He also told them the schedule and activities they will be performing during the 4 days. Ma. Gauritai Kher, Nagpur Nagar Pramukh, told stories to the children and also told them how this camp will help them to develop their personality and to become good and responsible future citizens. The children were divided into six groups. The groups were named after the famous personalities from the fields of science and spirituality – Shriramakrishna Paramahansa, Swami Vivekananda, Bhagini Nivedita, APJ Abdul Kalam, Vikram Sarabhai and Jayanta Naralikar. One more group named Ma Sharada group was formed separately for 30 organizing team karyakartas. Every evening from 5 to 6 pm lectures and activities were organized for this group. The topic for the first day was ‘Self Confidence’. Kum. Shivani Dani, Director of Money Bee company, Nagpur delivered a lecture on Sw. Vivekananda and self confidence which was followed by a group discussion session. 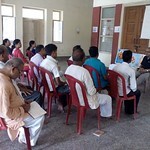 Ways to overcome fear and how to develop self confidence were discussed. Sau Gauri Deshpande concluded the session. The Topic for the second day was ‘Discipline’. Shri Chintan Magia explained the importance of discipline in simple interactive and effective way. Shri Lakheshwar Chandravanshi conducted the group discussion session after the lecture. ‘Bravery’ was the topic for the third day. Col. Sunil Deshpande, Director of Prahar School, motivated the children by his own war experiences. The lecture was followed by Question Answer session. Small stories of bravery were given to each group. Every group had to perform a skit based on the story. On the concluding day i.e. 27th April, Ma. Vishwasji Lapalkar, Maharashtra and Goa Pranta Sangathak, delivered a lecture on ‘Renunciation and Service’. The lecture was followed by Question Answer session. The main attraction of the camp was ‘Prerana se Punarutthan’ – a session after dinner – in which the theme ‘Atulya Bharat’ was highlighted through small skits and songs. A group of young karyakartas (age between 12 to 16 years) who regularly conduct the Samskar vargas, presented the theme in three parts of 30 mins. every day. In the creative session, envelop making and one stroke painting was taught. Dr. Hemant Wagh told the importance of conserving the environment. He conducted a workshop named ‘Fruit Basket’. He told how to collect seeds of different fruits and how the seeds will be helpful in saving mother Earth. Many seeds of different fruits were shown to the children and their role was explained very well. The children actively participated in this workshop. The concluding programme was conducted by the participants Vedant Lande and Shreya Dabe. All the parents were invited for the programme. The participants demonstrated Surya namaskars, group songs, small skits etc. Ma. Vishwasji Lapalkar, the main speaker was introduced by Shri vipin Vaidya, Saha Shibir pramukh. The vote of thanks was delivered by Dr. Vilasji Deshpande, Nagar Sahasanchalak. Sthanik Karyakartas worked hard to make the camp successful. The Swasthya Seva Manch (Medical Service Forum) Vivekananda Kendra Arun Jyoti organized six Free Medical camps in rural areas of Changlang district of Arunachal Pradesh. Camps were organized in New Chingsa and Namchik Havi of Kharsang circle, New Khimiyong of Mioa circle, Sohelaktong and Upper Bubang of Kantang circle and Khuchep of Changlang circle. A total 381 patients were examined in these camps and free medicines were distributed among the patients. 75 children were also given with Deworming medicines. The Mobile Medical Team of Arun Jyoti discussed various health related issues like clean and safe drinking water, sanitation, balanced diet with the villagers. Vivekananda Kendra is giving more emphasis on health awareness in the remote and rural areas of Arunachal Pradesh. Vivekananda Kendra Kamrup Vibhag has organised a Yoga Satra Varga Prashikshan on 1st May 2016 at VK Panbazar from 6.30am to 9.30am in presence of Meera Didi. 47 Karyakartas were present from different yoga vargas of Guwahati. 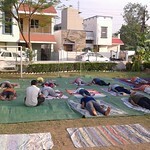 The names were listed before in Yoga varga core team baithak, whom we need to include for this prashikshan. We have targeted Karyakartas whom are regularly involved in Yoga satra or regularly participating in varga and can conduct satra after prashikshan. 1 : Four ganas are formed. The ganas sit and plan for 30 min practical. The new karyakartas in gana conduct with demonstration and instruction. 2 : Then all ganas came together. Sit in gana and feedback and correction. 3 : In concepts, the ganas discuss and present Dharmachakra, Akandamandalakar and Yujjate Anane Iti Yoga. In between games, subtle points of theory of Yoga were discussed. In this month, the furry squirrel is championing the cause of Rameswaram – “The anchor of Indian renaissance” by way of a blog by Shri.Narendra Joshi. You will also find a detailed report from our partners Hand in Hand on Solid Waste Management at Rameshwaram and C.P.Ramaswami Iyer Foundation on Mangala Vanam. Vivekananda Kendra Kanyakumari, Durgapur Branch Organized a Program for Children of Sanskar Varga on 14th April at Ganatantra Colony, M.A.M.C, Durgapur-10, Yugabotar Sri Sri Harichand Thakur Mandir. There was 150 participants in the program. The program was conclude by Sri Subatrata Mukherjee, Sri Ruhidas Ghosh, Sri Bikash Debnath, Subir Ranjan Das, Gour Roy, Nikhil Biswas, Mukunda Mondal, Gopal Tikader, Kashi Thakur. Parents also attanted the concluding program. There was special drama session in the program. Participants presented drama on Various theme on life of Swami Vivekananda.